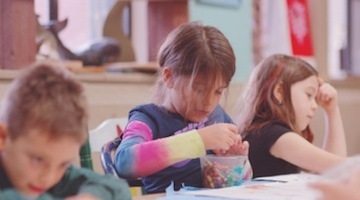 Discover what makes Buckman so special and what it means to be an arts-focused elementary school. Learn about our school's dynamite PTA and rockstar Foundation. 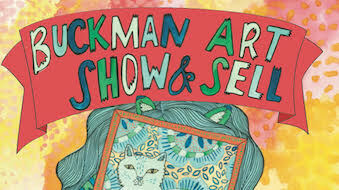 Buckman's annual Art Show and Sell will take place March 9-10, 2019. This festival of arts and crafts featured over 100 artists and proceeds benefit the Buckman PTA. Join us for the 30th Annual Auction on May 18th at The Hinson. Proceeds from Buckman's biggest fundraiser will fund the arts program teachers and other essential opportunities for students. Grab a plate of porky goodness from Lardo’s Hawthorne location and support the Arts at Buckman Elementary. 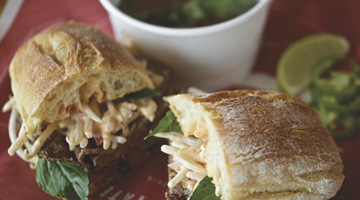 You’ll want to find room for the spicy and addictive Banh Mi, the rotating Chefwich featuring Portland’s finest or, if you’re really hungry, the formidable double burger with a side of fully adorned Dirty Fries. But don’t let that get in the way of the spot-on Escarole Caesar or the veggie-friendly mushroom “no meat” ball sub. 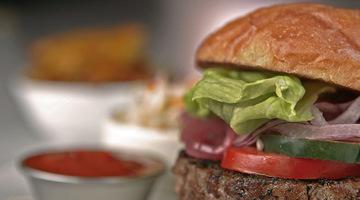 10% of your tab benefits Buckman | Monday, February 26, 11am–10pm at Lardo, 1212 SE Hawthorne Blvd. The 28th Annual Art Show & Sell is scheduled for March 10-11, 2018. This treasured yearly tradition brings together 130+ community artists and craftspersons together in support of the arts program at Buckman. Participants are given the opportunity to feature their work for sell, with a portion of their sales donated to the Buckman PTA. Student art is also on display, and many student groups perform over the course of the weekend. Suggested donation is $2-$5 at the door. Artist selection was posted on the Art Show & Sell website, with updates about activities planned for the exciting weekend. Updates are also available on the Art Show & Sell Facebook page. 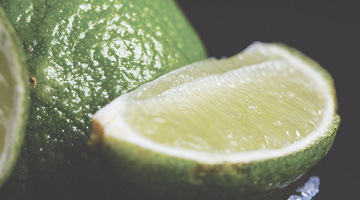 From smoky Barbacoa to crispy fish tacos to seasonal veggies, you’ll find tacos galore on fresh housemade tortillas at this popular neighborhood taquería. Whether you dine out at their colorful Hawthorne location or get it to go, your order will help to support Buckman. ¿Por Qué No? Taquería, 4635 SE Hawthorne Blvd. #GivingTuesday, the largest worldwide day of giving, is now in its sixth year. After Black Friday and Cyber Monday, #GivingTuesday falls on November 28 this year, as the philanthropic response we all need after the mayhem of holiday sales. Set out to support your favorite organizations, including your favorite elementary school! This #GivingTuesday, the Buckman Foundation will launch its Year End Ask campaign, an annual campaign wherein Foundation leadership turns to the Buckman community to directly ask for donations. As part of the campaign, members of the Buckman community are asked to participate in the Buckman matching gift challenge: if 75 contributors step up to the plate to donate at whatever level they are able, a group of Buckman families has agreed to give an additional $8,000! Donating is easy: head to All Hands Raised (select Buckman from the drop-down menu) or drop off a check in the Foundation mailbox. Grandparents, relatives, neighbors and friends are all invited to join in our Year-End efforts, so please share this news with them! The Buckman PTA has also launched a new playground project, and has partnered with Columbia Credit Union to raise the initial funds. From now until December 15, stop by their Goat Blocks location (950 SE 10th Ave) and enter your email address as a vote for Buckman. On #GivingTuesday, votes count double; if you mark yourself as “Checked-in” on Facebook, your vote counts triple! Columbia Credit Union has generously offered to donate up to $10,000 to this project, but we need enough votes to make it happen! Participation is FREE and only takes a minute of your time. 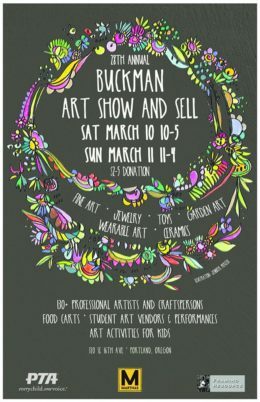 The 28th Buckman Art Show & Sell is currently accepting artist applications for the March 10-11, 2018 show. 140 juried local artists turn the school into a gallery over the weekend to benefit arts-integrated education. 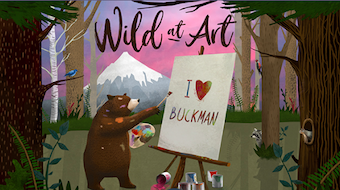 Buckman PTA volunteers run a central checkout station and there is no booth fee, artist donate 30% of sales to the Buckman PTA. 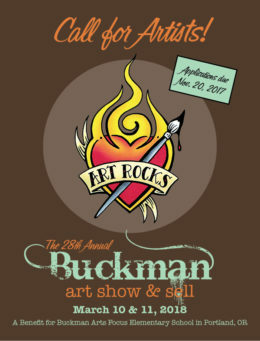 For more details, including a list of past vendors please visit the show website at http://buckmanartshow.weebly.com. You can also find us on Facebook. Corn Maze Tickets for Buckman! 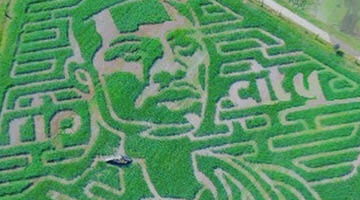 It’s Lillard Time at Bella Organic Farms Corn Maze! Support Buckman by taking your family and friends to the Bella Organic Farms Corn Maze. Our school keeps 50% of all the ticket sales!